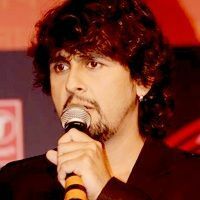 Check out the most updated and latest information about Sonu Nigam's on the Internet.We have 246 videos of Sonu Nigam including interviews, events, or public appearances.Sonu Nigam has over 148 Fans registered on India-Forums.com. We have 273 Bollywood News articles related to Sonu Nigam.Do share your criticism, comments and feedback for the Actor on Sonu Nigam's comments page. We have over 27 Photos of Sonu Nigam to view and download including Sonu Nigam's Wallpapers. Sonu Nigam, many singers will come and go but you are one singer who can never be forgotten. Sonu Nigam! u just rock! no one can ever beat u! U r the best n ur Voice... Love ur voice.. All the best..
sonuuu love u sooo much... give us some new pics of yours...! Phir Se from Toh Baat Pakki! OMG!! My favorite song !! Sonu Nigam! You're voice is golden! Hai Hai!